A teacher at Wabash College has been able to convince administration to include Portal on the required reading list. Thanks to college professor Michael Abbott, Portal is now part of the educational requirements at Indiana's Wabash College. The game has been officially approved for inclusion into a seminar required for all freshmen students where they analyze "classic and contemporary works from all disciplines." The course is "devoted to engaging students with fundamental questions of humanity from multiple perspectives and fostering a sense of community." It exposes students to poetry, the works of Aristotle, Shakespeare's Hamlet, and now Portal as well. Abbott was able to convince his non-gamer colleagues to include the game in the course's requirements as a "non-textual" source by aligning it directly with Erving Goffman's Presentation of Self in Everyday Life, a book that compares the presentation of one's self to a theatrical play that has a backstage where the truth is hidden. After ensuring Wabash's faculty that Steam wasn't going to install a virus, he proved Portal to be an example of the "backstage machination and onstage performance" aspect of humanity that Goffman presents. 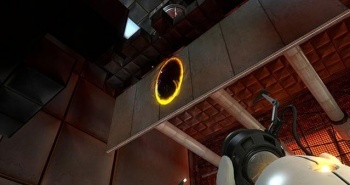 Now, after reading Goffman, students will follow it up with a playthrough of Portal. This is only the beginning of Abbott's schemes, as he's seemingly planning more videogame integration into the course, but he calls Portal a "good first impression" and "lead-off hitter" for instructors not used to teaching with videogames. Strangely enough, Portal 2's co-op campaign focuses on questions of humanity as well, so perhaps the sequel could be an easy progression for next year's class.